The accounts payable (A/P) way of paying bills involves two steps. The first is a trifle on the difficult side, and the second step is as easy as pie. First, you record your bills. You already might be familiar with using the Expenses tab and the Items tab to record bills. You need to fill out those tabs for the A/P method as well if you want to distribute a bill to accounts, customers, jobs, classes, and items. After you record your bills, you can go on to the second step: telling QuickBooks 2019 which bills to pay. Then QuickBooks writes the checks. You print them. You mail them. When you record bills the accounts payable way, you’re using accrual-basis accounting. When a bill comes in, the first thing to do is record it. You can record bills through the Enter Bills window or the Accounts Payable register. If you plan to track bills by expense and item, you need to use the Enter Bills window. Choose Vendors → Enter Bills. 2. Select the name of the vendor you’re paying. If you want to pay this bill to a vendor who’s already on the Vendor list, click the down arrow at the end of the Vendor line and choose the vendor. 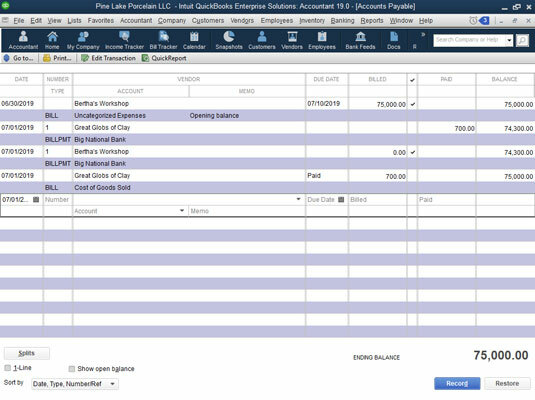 (Then QuickBooks automatically fills the Enter Bills window with as much information as it can remember.) If this vendor is new, QuickBooks asks you to Quick Add or Set Up some information about the vendor: the address, credit limit, payment terms, and so on. You provide this information in the New Vendor window. If you have one or more unfilled purchase orders with the vendor that you select, QuickBooks asks you whether you want to receive against a purchase order. Click Yes if you do or No if you don’t. If you choose to receive against a purchase order, QuickBooks displays the Open Purchase Orders dialog box, as shown. It lists the open purchase orders you’ve recorded. When you select one or more purchase orders to receive against, QuickBooks fills in the items and amounts from these orders for you, which you can modify as necessary. When you finish with the Open Purchase Orders dialog box, click OK to get back to the Enter Bills window. Paying a bill against a purchase order. 3. Select the payment terms describing when the bill is due. On the Terms line, open the drop-down menu and choose the payment terms (if the information isn’t already there from when you set up the vendor). 4. (Optional) Enter the vendor’s reference number. If you enter the vendor’s reference number for the bill — probably just the invoice number or your account number — the reference number prints on the voucher that’s part of the printed check. 5. (Optional) Enter a memo to describe the bill. 6. Move the cursor down to the Account column of the Expenses tab, and enter an expense account name. If you need to create a new expense account category for this bill, choose Add New from the top of the list. You see the New Account dialog box (not shown). Fill in the information, and click OK.
7. Tab over to the Amount column, if necessary, and change the numbers. 8. (Optional) Enter words of explanation or wisdom in the Memo column. 9. (Optional) Assign the expense to a Customer:Job. If you plan to be reimbursed for these expenses, or if you just want to track your expenses by job, enter the customer who’s going to reimburse you. Enter an amount for each account if necessary. You can use the down arrow to find customers and then click them. If you do assign a Customer:Job, you also have the option to bill these expenses or items being purchased to the client. To do so, click the Billable column and you should see a check mark now. Next time you invoice this job, you should see the option to add these items to the invoice automatically. 10. (Optional) Assign the expense to a class. If you want to have QuickBooks track expenses by class, you can set it up to do so. To set up QuickBooks to track expenses, choose Edit →Preferences. When QuickBooks displays the Preferences dialog box, click the Accounting icon, click the Company Preferences tab, and then select the Use Class Tracking check box. 11. Use the Items tab to record the various items that the bill represents. From the Vendor drop-down menu, choose the name of the vendor who sent you the bill. In the list of open purchase orders, click in the column on the left to put a check mark next to the purchase order (or orders) for which you’re paying. Easy enough? Click OK when you’re done; QuickBooks fills out the Items tab for you automatically. 12. Move to the Item column, and enter a name for the item. 13. Fill in the rest of the rows of items on the Items tab. You also can enter bills directly in the Accounts Payable register. This method is faster, but it makes tracking expenses and items more difficult. 1. Choose Lists→Chart of Accounts or click the Chart of Accounts icon on the home page. 2. Open the Accounts Payable account. 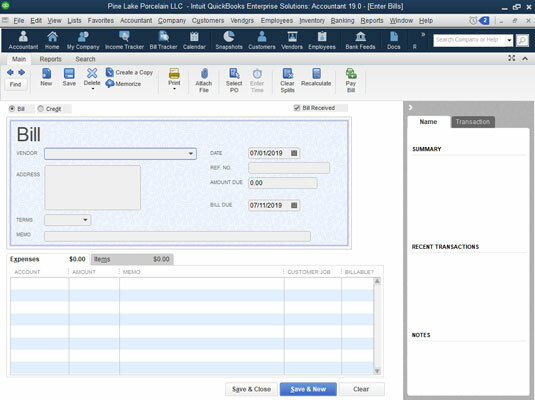 When QuickBooks displays your Chart of Accounts, double-click the Accounts Payable account in the list. You see the Accounts Payable register window, as shown. The cursor is at the end of the register, ready and waiting for you to enter the next bill. The Accounts Payable register window. 3. Fill in the information for your bill. Enter the same information that you would if you were filling in the Enter Bills window. In the Vendor text box, click the down arrow and choose a name from the Vendor drop-down menu. If you enter a vendor name that QuickBooks doesn’t recognize, you see the Vendor Not Found message box, and QuickBooks asks you to give information about this new, mysterious vendor. Click Quick Add to have the program collect the information from the register as you fill it out, or click Set Up to see the New Vendor dialog box. You have to select an account name. You can probably find the right one in the Account drop-down menu; if you can’t, enter one of your own. You see the Account Not Found message box, and QuickBooks asks you to fill in information about this new account. If you decide while you fill out the register that you want to be reimbursed for this check or that you want to track expenses and items, click the Edit Transaction button to see the Enter Bills window. When you finish filling in the window, click Save & New. You’re back where you started: in the Accounts Payable window. 4. When you fill in all the information, click Record. If you don’t remember the date, choose the Edit →Find. 2. Select the bill that you want to delete by clicking anywhere in the bill. 3. Choose Edit →Delete Bill. Remind me to pay that bill, will you? You could tie a string around your finger, but the best way to make sure that you pay your bills on time is to have QuickBooks remind you. In fact, you can make the Reminders message box the first thing that you see when you start QuickBooks. To adjust the QuickBooks reminder options, you must be logged on as the administrator in single-user mode. Then choose Edit→Preferences. 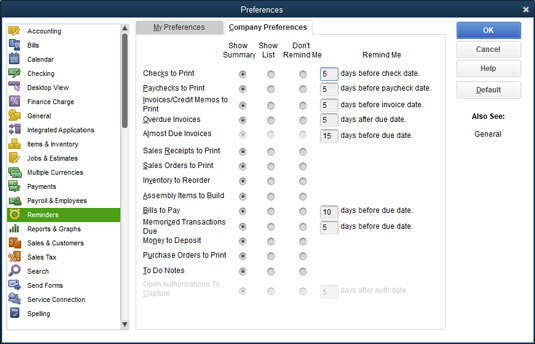 When QuickBooks displays the Preferences dialog box, click the Reminders icon in the list on the left and then click the Company Preferences tab to access the dialog box shown here. The Reminders section of the Preferences dialog box. Make sure that either the Show Summary or Show List option button is selected (you can’t choose Don’t Remind Me and expect to get a reminder) and then give yourself several days’ notice before you need to pay bills by typing a number (10 is the default and usually works well) in the Days Before Due Date text box, located in the Remind Me column. You may want to review the Reminders window when you start QuickBooks or open a new company file. The window lists reminders (such as forms you need to print and payments you need to transmit) and tells you which unpaid bills you’re supposed to pay. You can see this list by choosing Company→Reminders. Note that you can also tell QuickBooks to display any reminders when opening the company file. To do this, choose the Edit → Preferences command, click Reminders, click My Preferences, and then select the Show Reminders List when Opening a Company File check box.